About us | PraxisAuril supports Knowledge Exchange and Commercialisation in the UK and internationally. 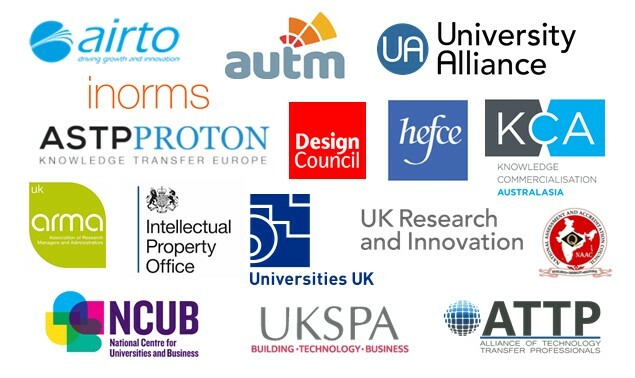 PraxisAuril supports KEC in the UK and works with key stakeholders and partners to promote best practice in the sector. promoting best practice for our sector. We facilitate interactions between the public sector research base, business and government; bringing together key stakeholders to debate, educate and inform. We have over 173 member institutions and over 5000 individuals receive our monthly news updates. Our annual conference typically attracts 300+ practitioners and industry experts. For over 10 years PraxisAuril has been taking best practice from the UK to established and developing economies. Today, our international business takes skills and best practice to more than 40 countries around the world. We work with world-class individuals and organisations, bringing together the best people in KEC to enable knowledge sharing globally. PraxisAuril is a founder-member of the Alliance of Technology Transfer Professionals (ATTP), the organisation established to provide a global standard of professional achievement through RTTP. We work with universities, research councils, Catapults and other public sector research establishments to deliver the translaton of research outcomes into social and economic impact. Find out more about how you can get involved or take a look at the FAQs. PraxisAuril is a not-for-profit organisation, run by a Board of expert-practitioners who volunteer their time. Committees, run by member-volunteers, are responsible for the delivery of activities, supported by a core office team based in Cambridge. PraxisAuril was founded by Lita Nelsen, Consultant, Adviser in Technology Transfer, lecturer and retired Director of Technology Licensing at MIT, and David Secher, Life Fellow at the University of Cambridge, who both continue their involvement as Patrons of PraxisAuril. PraxisAuril's activity is steered by three Committees, which are overseen by its Board. The Board and Portfolios are populated by expert practitioners who are passionate about sharing best practice and volunteer their time to shape the profession. PraxisAuril's success depends upon the enthusiasm and energy of these expert practitioners, who work alongside PraxisAuril's professional staff to design, deliver and inform a broad range of activities in policy, training and conference programme development. If you would like to become involved with one of our committees, we encourage members to volunteer. The Advocacy Committee represents the PraxisAuril membership and our organisation's values on matters affecting the knowledge exchange and technology transfer profession. We do this by responding to government and other sector consultations, by engaging with policy makers and influencers at a national and regional level, and by proactively voicing an opinion through publications, events and online media. The Committee is one of the largest of PraxisAuril's practitioner committees as it is important for us to represent a broad mix of our member organisations and their research commercialisation cultures. The Conference Committee is responsible for the design and delivery of the programme for the annual PraxisAuril conference. The Committee is formed of volunteers from across the PraxisAuril membership who bring a wealth of experience and knowledge to the event. We hope you'll find the answers to common questions here. If you need further assistance please contact info@praxisauril.org.uk. Learn more about careers in KEC. KEC practitioners work to identify opportunities, often but not always commercial in nature, to enable research to translate into impact. This involves activities such as identifying and setting an IP strategy, securing patents, raising finance, negotiating licenses, drafting and negotiating contracts, securing strategic partnerships with external sponsors/industry contacts/other research institutes, identifying and securing collaborative research opportunities, forming spin-out companies and new ventures, managing consultancy and CPD contracts, marketing knowledge exchange opportunities and building strategic relationships at all levels. Learn more about what KEC professionals do. KEC delivers significant social and economic benefits to the UK. See our Advocacy pages for more information on why KEC matters. We’re always looking for new individuals and organisations to work with us and there are many ways that you can get involved. To help us find what’s best for you, please tell us how you’d like to work with us by completing the form below. We will contact you as relevant opportunities become available. Different roles require different time investments. Some such as the Conference Committee require a sustained input which increases towards the time of the Conference in June, others such as Advocacy are more ad hoc in nature. If you have some time available and want to get involved, there are always opportunities available - please get in touch. How long do I have to commit to be a volunteer? The term of office for Committee Chairs is two years, and we encourage Committee members to view their involvement in similar timescales. Often we will encourage new members to shadow current members for their first year in the role, and many volunteers remain involved for many years beyond that - but it is, of course, entirely up to you. When does PraxisAuril recruit volunteers? We are always keen to hear from new volunteers! Applications to join the Conference, Training, Industry Engagement, International or Advocacy Committees will be reviewed by the Executive Director and the Committee Chair throughout the calendar year and new appointments made as opportunities arise.